This batch process allows a System Admin to make changes to groups of records at one time. Because this function uses either a Tag or Search Builder results, you will want to make sure you know how to create a Tag and how to run a query/search to get the results you want. This feature is to be used with extreme caution as it allows the System Admin to make wholesale changes to certain fields for multiple records at one time. Drop every person in your tag/query from every org in which he is enrolled. Make him a Previous Member of those orgs with a Drop Date set to the day you make the change. We do not recommend dropping church members using this batch process since this is such an individual matter. However, you can do this using the batch process if needed. First you select Member Status and then select Previous Member . Run the update. Next, select Drop Type and then select the appropriate type. Run the update again. NOTE: This will not set a drop date. That must be done on the individuals’ records. I have created a Tag of people that all have the same Employer, but the name is not consistent. I named the Tag ”FedEx Employees”. I want to change the Employer to ‘FedEx” for all of these people at one time rather than going to each record to make the change. Create and name a Tag for those records you want to change. Add the appropriate people to the Tag. Select Administration > Batch Actions > Update Fields from a Tag/Query . On the Tag drop down menu, select the Tag for the group you want to update. A box will pop up displaying number of records in the tag/query. Then select the Field to update from the drop down menu. In this example, it would be Employer. This will update the Employer field with “FedEx” for all records in your FedEx Employees Tag. Once it is finished, a message will display letting you know how many records were affected. I created a tag named Joint Contributions for people who need to have their Contribution Statement Option changed to Joint. How do I change the Statement Option to Joint? Select Contribution Statement and then select Joint . Once you are satisfied that everything is correct click Run . This will update the Contribution Statement Option for everyone in the Tag, setting it to Joint. I want to increase the Grade by 1 for each person with a Grade on his people record. I would do this after annual promotion. The image below list the options relating to updating your grades. For this use case you would select Add 1 Grade Level which will add 1 to all the grades for those in your Tag. Follow Steps 1 & 2 in Use Case #1. Select your tag (or use your last query, if you found those records that way) for those whose grade you want to increase by 1. Select Grade from the list. Then select the last option Add 1 Grade Level . This will update the Grade field on the people record for everyone in the Tag, increasing it by 1. To see the definitive list of available fields to update, look at the Administration > Batch Actions > Update Fields for a Tag/Query page on your database. We continue to add for options as needed. This batch update is not just updating a field. You would use this if you have a Tag with leaders that need to be given OrgLeadersOnly user accounts. When you run this update, the next time any of the leaders log in to TouchPoint or create an account, they will be given the role Access and OrgLeadersOnly. Exception: If they already have Access role without OrgLeadersOnly, nothing will be changed. The Grade drop down has a lot of options, including Remove Grade , which can be used for all former 12th graders once they graduate, or if you have adults in your database with the grade 0 on their records. Also, there is an option for a Custom Grade (int) using an integer if none of the other options fit your needs. 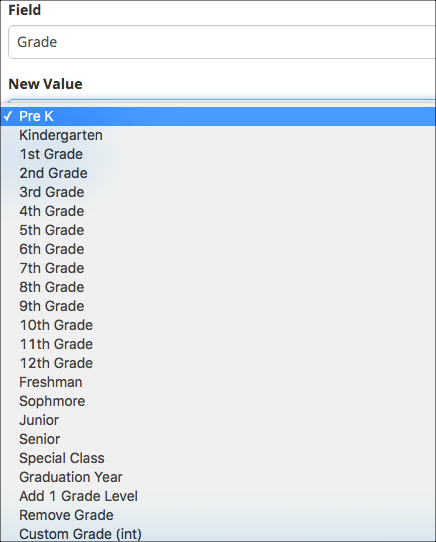 If you select Kindergarten the grade will display as 0, Pre-K will display as -1. So, if you want a grade for those in 3 yr old classes, you would select Custom Grade (int) and enter -2 in the field; for 2 yr old you would enter -3. The Special Class option will set the Grade to 99 on the people record. This might be used for special needs classes that have all ages in them. For college students, you can use the options for Freshman , Sophomore , etc. Freshman will put 13 on the person’s record, Sophomore 14, and so on.